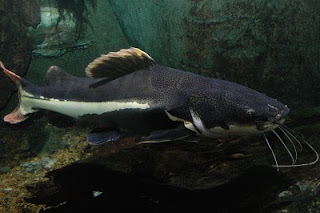 Redtail Catfish go by several different names including the South American Red Tail Catfish, Cajaro and Pirarara. These freshwater fish have a very wide mouth and a body that is dark gray with a white band that runs around the lower half of their bodies. They have three pairs of long barbels as well, which is a trait shared by all the Catfish in the Pimelodidae family. As you can see, they get their name from their caudal fin or tail which is red. When this fish is younger its colors tend to be more intense. 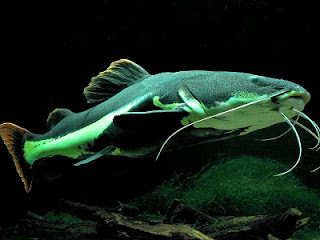 Redtail Catfish are omnivores that should be fed a variety of foods including fruits, crustaceans and fish. Watch out, this fish will pretty much eat anything that it can fit into its mouth. Be careful with other tankmates, and even objects in the tank. They will often eat decorations and then regurgitates them. As you can imagine, this is not very healthy for the fish. Be careful not to overfeed them as well, once a week should be fine.